A collection of my publications and media appearances on education, skills, apprenticeships and welfare reform. Britain will need more science skills if it is to prosper. 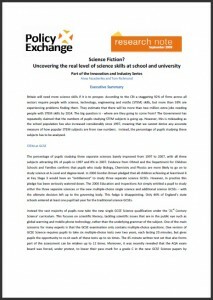 According to the CBI a staggering 92% of firms across all sectors require people with science, technology, engineering and maths (STEM) skills, but more than 59% are experiencing problems finding them. The Government has repeatedly claimed that the numbers of pupils studying STEM subjects is going up. However, this is misleading as the school population has also increased considerably since 1997, meaning that we cannot derive any accurate measure of how popular STEM subjects are from raw numbers. Our report debunked the Government’s claims about the performance and take-up of science subjects at every level – GCSE, A Level and degree. Instead, misleading figures and lowered standards were found to behind many of the apparent ‘improvements’, with the result that British businesses now face a critical skills shortage.